United States presidential elections in Pennsylvania occur when voters in the U.S. Commonwealth of Pennsylvania cast ballots for electors to the Electoral College as part of a national election to elect the President and Vice President of the United States. Regularly scheduled general elections occur on Election Day, coinciding with elections in the other 49 states and the District of Columbia. As in other states in the U.S., presidential elections are indirect elections. Voters do not cast ballots directly for a presidential candidate, but rather a slate of electors pledged to support that candidate, with the victorious slate of electors casting their ballots directly for President and Vice President of the United States as part of the Electoral College. During the first presidential election in 1789, Pennsylvania was allotted 15 electoral votes. In 2012, the most recent election, the state was allotted 20. This number, proportional to the state's population and decided every 10 years after a census, peaked at 38 from the 1912 election through the 1928 election. The next presidential election in Pennsylvania, coinciding with the national election, is scheduled for November 3, 2020. The list below contains election returns from all 57 quadrennial presidential elections in Pennsylvania, beginning with the first in 1789 and ending with the most recent in 2012. Incumbent Presidents are listed as well as presidential candidates who carried Pennsylvania and runner(s)-up in the state, including major third-party candidates (garnering five percent or more of the popular vote). Bold indicates the candidate who won the election nationally. Parties are color-coded to the left of a President's or candidate's name according to the key below. The popular vote and percentage margins listed in the "Margin" column are the differences between the total votes received and percentage of the popular vote received by the top two finishers in the corresponding election (i.e. the margin-of-victory of a candidate who carried Pennsylvania over the nearest competitor). The "E.V." section denotes the number of electoral votes cast in favor of the candidate who carried the state, which has been unanimous except for two occasions—1796 and 1800—in which the number in parentheses represents the number of votes cast for the runner-up. In all, the Republican Party has carried Pennsylvania in 25 presidential elections, the Democratic Party in 19, the Democratic-Republican Party in eight, the Whig Party in two, and the Progressive Party in one (1912). A nonpartisan candidate, George Washington, carried the state twice (in 1789 and 1792). Pennsylvania has voted for the overall victor in 46 of 57 elections (80.7% of the time). Note: Bold candidate indicates President elected nationally. ^ Percentage of voting age population (VAP) unless otherwise noted. ^ One electoral vote was cast for John Adams. ^ Electors in 1800 were chosen by the state legislature. In addition to eight electoral votes for Jefferson, Pennsylvania cast seven for Adams. ^ Zachary Taylor died in July 1850. Millard Fillmore served the remainder of the unexpired term and did not seek election to a full term. ^ Abraham Lincoln sought re-election on the National Union ticket in 1864. ^ Abraham Lincoln was assassinated in April 1865. Andrew Johnson served the remainder of the unexpired term and did not seek election to a full term. ^ James Garfield was assassinated in 1881. Chester Arthur served the remainder of the unexpired term and did not seek election to a full term. ^ William McKinley was assassinated in September 1901. Theodore Roosevelt served the remainder of the unexpired term and sought and won election to a full term. ^ Warren Harding died in August 1923. Calvin Coolidge served the remainder of the unexpired term and sought and won election to a full term. ^ Franklin D. Roosevelt died in April 1945. Harry S. Truman served the remainder of the unexpired term and sought and won election to a full term. ^ John F. Kennedy was assassinated in November 1963. Lyndon B. Johnson served the remainder of the unexpired term and sought and won election to a full term. ^ Richard Nixon resigned in August 1974. Gerald Ford served the remainder of the unexpired term and sought election to a full term. ^ "Electoral College". Pennsylvania Department of State. Retrieved 29 December 2014. ^ "U.S. Electoral College". National Archives and Records Administration. Retrieved 29 December 2014. ^ "Historical Election Results". U.S. Electoral College. National Archives and Records Administration. Retrieved 29 December 2014. ^ "Pennsylvania Presidential Election Returns 1796". Wilkes University. Retrieved 26 January 2014. ^ "Pennsylvania Presidential Election Returns 1804". Wilkes University. Retrieved 26 January 2014. ^ "Pennsylvania Presidential Election Returns 1808". Wilkes University. Retrieved 26 January 2014. ^ "Pennsylvania Presidential Election Returns 1812". Wilkes University. Retrieved 26 January 2014. ^ "Pennsylvania Presidential Election Returns 1816". Wilkes University. Retrieved 26 January 2014. ^ "Pennsylvania Presidential Election Returns 1820". Wilkes University. Retrieved 26 January 2014. ^ "Pennsylvania Presidential Election Returns 1824". Wilkes University. Retrieved 26 January 2014. ^ "Pennsylvania Presidential Election Returns 1828". Wilkes University. Retrieved 26 January 2014. ^ "Pennsylvania Presidential Election Returns 1832". Wilkes University. Retrieved 26 January 2014. ^ "Pennsylvania Presidential Election Returns 1836". Wilkes University. Retrieved 26 January 2014. ^ "Pennsylvania Presidential Election Returns 1840". Wilkes University. Retrieved 26 January 2014. ^ "Pennsylvania Presidential Election Returns 1844". Wilkes University. Retrieved 26 January 2014. ^ "Pennsylvania Presidential Election Returns 1848". Wilkes University. Retrieved 26 January 2014. ^ "Pennsylvania Presidential Election Returns 1852". Wilkes University. Retrieved 26 January 2014. ^ "Pennsylvania Presidential Election Returns 1856". Wilkes University. Retrieved 26 January 2014. ^ "Pennsylvania Presidential Election Returns 1860". Wilkes University. Retrieved 26 January 2014. ^ "Pennsylvania Presidential Election Returns 1864". Wilkes University. Retrieved 26 January 2014. ^ "Pennsylvania Presidential Election Returns 1868". Wilkes University. Retrieved 26 January 2014. ^ "Pennsylvania Presidential Election Returns 1872". Wilkes University. Retrieved 26 January 2014. ^ "Pennsylvania Presidential Election Returns 1876". Wilkes University. Retrieved 26 January 2014. ^ "Pennsylvania Presidential Election Returns 1880". Wilkes University. Retrieved 26 January 2014. ^ "Pennsylvania Presidential Election Returns 1884". Wilkes University. Retrieved 26 January 2014. ^ "Pennsylvania Presidential Election Returns 1888". Wilkes University. Retrieved 26 January 2014. ^ "Pennsylvania Presidential Election Returns 1892". Wilkes University. Retrieved 26 January 2014. ^ "Pennsylvania Presidential Election Returns 1896". Wilkes University. Retrieved 26 January 2014. ^ "Pennsylvania Presidential Election Returns 1900". Wilkes University. Retrieved 26 January 2014. ^ "Pennsylvania Presidential Election Returns 1904". Wilkes University. Retrieved 26 January 2014. ^ "Pennsylvania Presidential Election Returns 1908". Wilkes University. Retrieved 26 January 2014. ^ "Pennsylvania Presidential Election Returns 1912". Wilkes University. Retrieved 26 January 2014. ^ "Pennsylvania Presidential Election Returns 1916". Wilkes University. Retrieved 26 January 2014. ^ "Pennsylvania Presidential Election Returns 1920". Wilkes University. Retrieved 26 January 2014. ^ "Pennsylvania Presidential Election Returns 1924". Wilkes University. Retrieved 26 January 2014. ^ "Pennsylvania Presidential Election Returns 1928". Wilkes University. Retrieved 26 January 2014. ^ "Pennsylvania Presidential Election Returns 1932". Wilkes University. Retrieved 26 January 2014. ^ "Pennsylvania Presidential Election Returns 1936". Wilkes University. Retrieved 26 January 2014. ^ "Pennsylvania Presidential Election Returns 1940". Wilkes University. Retrieved 26 January 2014. ^ "Pennsylvania Presidential Election Returns 1944". Wilkes University. Retrieved 26 January 2014. ^ "Pennsylvania Presidential Election Returns 1948". Wilkes University. Retrieved 26 January 2014. ^ "Pennsylvania Presidential Election Returns 1952". Wilkes University. Retrieved 26 January 2014. ^ "Pennsylvania Presidential Election Returns 1956". Wilkes University. Retrieved 26 January 2014. ^ a b c d e f g h i j k l m n "Voter Registration Statistics". Pennsylvania Department of State. Retrieved 30 January 2014. ^ "Pennsylvania Presidential Election Returns 1960". Wilkes University. Retrieved 26 January 2014. ^ "Pennsylvania Presidential Election Returns 1964". Wilkes University. Retrieved 26 January 2014. ^ "Pennsylvania Presidential Election Returns 1968". Wilkes University. Retrieved 26 January 2014. ^ "Pennsylvania Presidential Election Returns 1972". Wilkes University. Retrieved 26 January 2014. ^ "Pennsylvania Presidential Election Returns 1976". Wilkes University. Retrieved 30 January 2014. ^ "Pennsylvania Presidential Election Returns 1980". Wilkes University. Retrieved 30 January 2014. ^ "Pennsylvania Presidential Election Returns 1984". Wilkes University. Retrieved 30 January 2014. ^ "Pennsylvania Presidential Election Returns 1988". Wilkes University. Retrieved 30 January 2014. ^ "Pennsylvania Presidential Election Returns 1992". Wilkes University. Retrieved 30 January 2014. ^ "1996 Presidential General Election Results - Pennsylvania". U.S. Election Atlas. Retrieved 30 January 2014. ^ "2000 General Election". Pennsylvania Department of State. Retrieved 30 January 2014. ^ "2004 General Election". Pennsylvania Department of State. Retrieved 30 January 2014. ^ "2008 General Election". 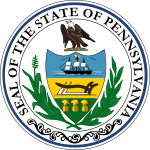 Pennsylvania Department of State. Retrieved 30 January 2014. ^ "2012 General Election". Pennsylvania Department of State. Retrieved 30 January 2014. ^ "2016 General Election". Pennsylvania Department of State. Retrieved 26 January 2017. This page was last edited on 10 March 2019, at 14:25 (UTC).